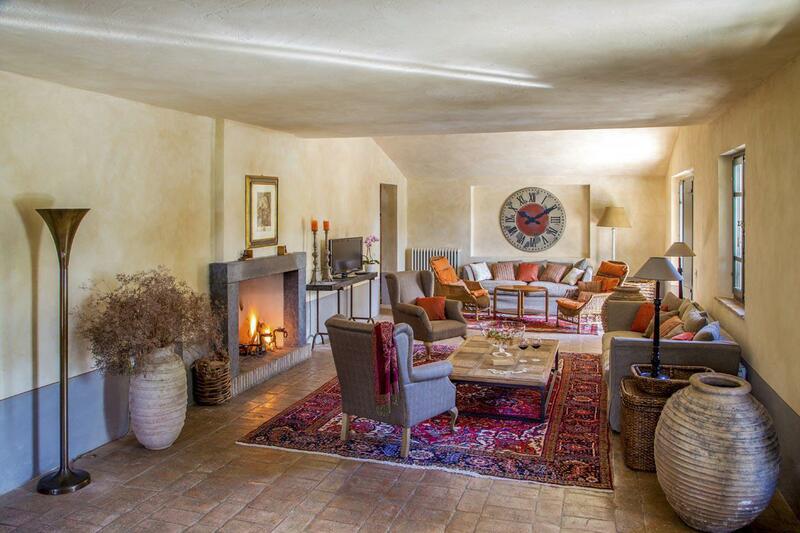 The holiday villa of "Villa Morgana" can be found 3 kilometres from San Casciano dei Bagni, in Siena - Italy. Sleeping 14 people in 7 bedrooms. The bedrooms are made up of: Twin bedroom with en-suite bathroom; Large master bedroom with king-size four-poster bed and views over the garden with door opening to the pool. En-suite bathroom with bath and integrated shower; Twin bedroom (twins can be combine) with iron frame beds; Double bedroom with queen-size canopy bed; Second master bedroom with four-poster kin-size bed with views of the stunning countryside, very large closet and en-suite bathroom with bathtub and integrated shower; Double bedroom with desk opening onto a private west-facing terrace with views over Monte Amiata and Monte Cetona. Walk-in closet and en-suite bathroom; Twin Bedroom (twins can be combine). There are 6 bathrooms at Villa Morgana - so there shouldn't be a queue for the bathroom. Villa Morgana is a good size for friends and family to enjoy. Should you like to venture out in the evening, the restaurant is 1.5 kilometres in Restaurant and the shop is 3.5 kilometres from Villa Morgana in Supermarkets & Shops. Sorry, there are currently no reviews for Villa Morgana (https://www.oliverstravels.com/italy/tuscany/siena/villa-morgana/). If you're looking for other villas around Villa Morgana, we've got some villas below which may take your liking. There are 16 villas within 15 miles of Villa Morgana - and most have reviews too.